Massachusetts residents are used to weighing the pros and cons of local casino development. Economic concerns about money management and job creation or cultural concerns about gambling and crime top the list for most people. On the last Tuesday night in October at Tufts University an equally important subject was addressed, environmental impact. Project managers for the proposed Wynn casino in Everett took the floor in front of a public gathering organized by the Mystic River Watershed Association (MyRWA) and laid out their plans. Presenters Bob DeSalvio and Jamie Fay sent a message that environmental development is a top priority. Inspiration for their project comes from previous experience in Pennsylvania where the expansive and environmentally defunct Bethlehem Steel Mill was developed into a casino. Success with that project has apparently inspired billionaire Steve Wynn who is looking to bring his brand to the Mystic River local. It is an equally if not more confounding effort because the Everett site was home to industries like Monsanto Corp who polluted for more than 100 years. Recent surveys reveal a shoreline contaminated with arsenic, lead, and unhealthy pH levels. Animal and plant life consists of little more than worms and algae. Even with all that, Wynn developers are confident their ingenuity along with local collaboration and $30 million in private funds is enough to make the area flourish. All these ideas didn’t originate within Wynn’s team. Inspiration came from community members who are used to playing the stewardship role and MyRWA commended an inclusive relationship several times. 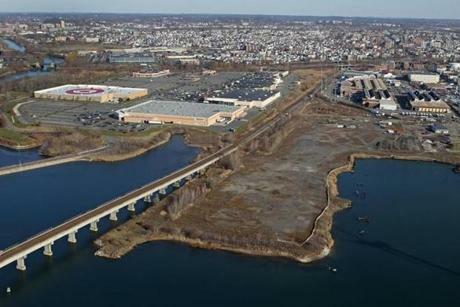 The Mystic River Master Plan, Lower Broadway Master Plan, and Everett Municipal Harbor Plan were originally written at the local level and influenced casino project managers. Their philosophy is that no idea should be turned away and the best ones will be implemented. It’s rare for a casino developer to discuss proposals in a public setting without heated counterarguments. This night was different, mostly because the sponsoring environmental group MyRWA was also heaping praise on the project. The only lingering doubt came from a statement made by Mr. Fay that he, “could not think of other options for developing the site.” This lead to an impression that if casino developers don’t turn around Everett’s shoreline then it will stay a polluted mess. Massachusetts residents should not think casino money is the only solution to our environmental issues. Medford, Malden and every other Mystic River community has developed residential and recreational areas on top of troubled sites. Where there’s a will there’s a way and Everett can do the same without all the other concerns coming from casino development. Ultimately community members will be left with their own list of pros and cons. The more information is available, the more we are likely to make a decision that’s right for us. Tuesday night at Tufts provided information that is usually left off the front pages. Let us all make good decisions with it. Well said. While I applaud them for preparing a comprehensive plan for the environmental remediation (for which they clearly have a decent budget – I wonder where that might come from…), I agree that reinvigorating sensitive but valuable greater Boston property can be done responsibly, both for the community and the environment.